JOHN ADAMS. 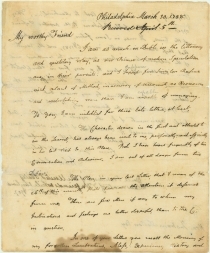 Autograph Letter Signed, as President, to Tristram Dalton, March 30, 1798, Philadelphia, [Pa.] 2 pp., 8 x 9&frac78; in. I am as much in Debts in the literary and epistolary way, as our Princes of modern Speculation are in their pursuits: and I suppose for Similar Reasons viz want of Method, in accuracy of amounts, no Economy and undertaking more than I am capable of managing. To you, I am indebted for three late letters, at least. The Character drawn in the first and alluded to in the Second, has always been civil to me, personally; and especially in his last visit to this Place. But I have heard frequently of his Conversation and Behavior. I am out of all danger from his designs. The Plan, in your last Letter, that I mean of the 26th of this month, shall have all the attention it deserves from me. There are few Men if any to whom my Inclinations and feelings are better disposed, than to the C. in question. Earlier in the month, Adams and his Cabinet had received reports of the humiliation suffered by John Marshall, Charles C. Pinckney, and Elbridge Gerry in Paris. French Foreign Minister Charles Talleyrand told the three diplomats through French officials indentified in the United States as “X,” “Y,” and “Z” that negotiations would not proceed unless they paid a personal bribe of $250,000. France, in the midst of war with Britain, had authorized its naval vessels to seize American shipping. A small American Navy was beginning to respond in kind in this “Quasi-War.” In hopes of avoiding open war with their old revolutionary allies, Adams had sent Marshall, Pinckney, and Gerry, but now, as of March 1798, it appeared a declaration of war might be necessary. Adams called a special session of Congress in hopes of mobilizing for war while also sending new diplomatic envoys to France. On March 16, he addressed Congress, informing them of the XYZ affair, all of which sparked the bitterest partisanship the young republic had yet seen. The “forgotten Lucubrations” (overelaborate writings) are Adams’ Defense of the Constitutions of Government of the United States of America (1787). Dalton was among those who received presentation copies of the first volume, along with Thomas Jefferson, Lafayette, Samuel Adams and a few other close friends. Abigail Adams described the work as “an investigation into the different forms of government, both ancient and modern . . . with the purpose of demonstrating the superiority of mixed forms over simple ones,” such as the more democratic, unicameral legislature advocated by Jacques Turgot. A Harvard classmate of Adams, Dalton was later Speaker of the Massachusetts House of Representatives and then the state’s first Senator. Dalton frequently wrote to Adams to commiserate about what they both deemed the reckless upsurge of democracy in the new nation.